The latest batch of rate filings approved by Illinois insurance regulators in August showed rate increases at 16 insurers. The following approved changes were made for personal auto insurance policies and are on average, with actual rate adjustments ranging from customer to customer. 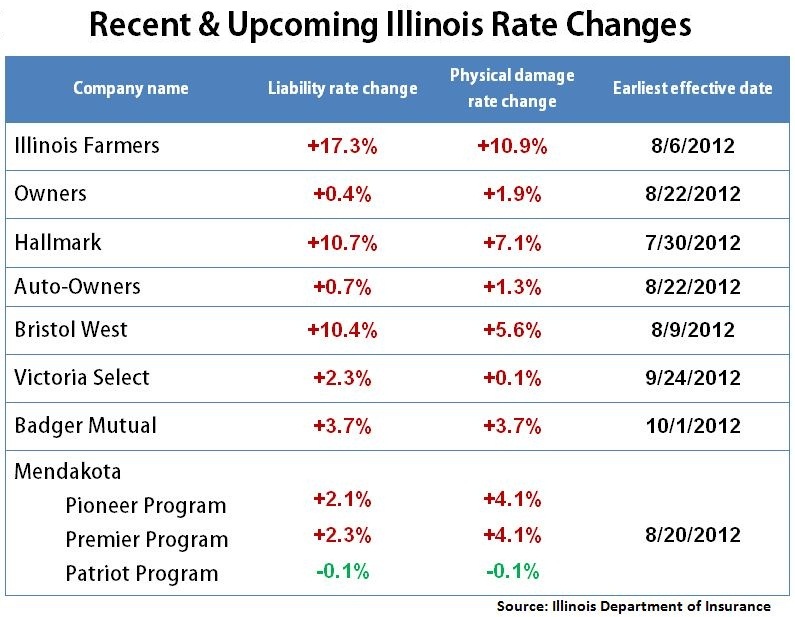 Illinois Farmers was approved for some of the larger changes out of all the rate filings, with liability rates increasing 17.3 percent and physical damage rates increasing 10.9 percent at the beginning of August. The insurer was also one of the larger underwriters in the filings, writing more than $200 million in personal auto premiums in the state. Owners, another relatively large underwriter with almost $50 million in personal auto policies, was approved for smaller increases of 0.4 percent for liability and 1.9 percent for physical damage. Those changes took effect at the end of August for new customers and will kick in at the end of September for renewing policyholders. –Within the Pioneer program, liability policies were approved for a 2.1 percent increase while physical damage policies were approved for a 4.1 percent increase. –The Premier program was approved for a 2.3 percent increase to auto liability and 4.1 percent to physical damage. –The Patriot program was approved to decrease both liability and physical damage policies by 0.1 percent. Approval for increases at Hallmark brought up liability policies by 10.7 percent and physical damage policies by 7.1 percent. Those changes are already in effect. Auto-Owners approvals, which go into effect Sept. 27 for renewing business and already went into effect Aug. 22 for new customers, sent liability policies up by 0.7 percent and physical damage policies by 1.3 percent. Changes to Bristol West policies took effect at the beginning of August, boosting liability policies by 10.4 percent and physical damage policies by 5.6 percent. The company underwrites a little more than $15 million in those policies. On Sept. 24, Victoria Select will increase liability policies by 2.3 percent and physical damage policies by 0.1 percent for new business. Badger Mutual will hike both auto liability and physical damage rates by 3.7 percent at the beginning of October. A handful of other companies were approved for increases, but they do not go into effect until November or December. Check back for updates on those. This information is based on rate filings released by state insurance regulators, whose duties include analyzing insurers’ requests to change their rates and aiding consumers, whether that means answering car insurance questions or investigating policyholders’ complaints.